It’s apple-picking season! 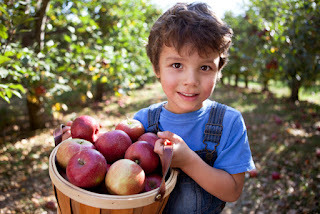 Whether you are returning to a favorite orchard or trying this activity for the first time, here are some ideas to make your family’s visit even more fun, plus nine other suggestions to help your kids connect with nature this fall. These activities are all simple, free or low-cost, and recommended by AMC authors, parents, and naturalists. 1. Go apple picking at a local orchard. Pick three or four varieties and have a taste test. Or try bobbing for apples, baking pies, or making your own applesauce. To find an orchard with pick-your-own hours, search on the nonprofit New England Apple Association website by state, zip code, or even the varieties of apples the orchards grow. The site also includes many recipes to try at home, including microwave applesauce, apple-carrot muffins, and baked apples. 2. Create autumn art. Collect leaves and iron them between sheets of wax paper to make a bookmark or window decoration. 3. Make a leaf sailboat. A fallen leaf can be the sail, a stick the mast, and a pinecone or piece of bark the boat body. Head to a nearby pond, stream, or backyard kiddy pool to sail it. 4. Start next year’s garden. Plant flower bulbs and talk with children about how they will sprout in spring. 5. Watch the birds. Talk about fall migration and go to a nature preserve to see the birds in flight. Or just point out the honking geese passing by your neighborhood. 6. Have fun raking. Before clearing the leaves, make a big pile and give kids time to hide, jump, and run through them. 7. Eat what’s in season. Go to a farmer’s market and choose some local vegetables for a nice soup. 8. Go leaf peeping. Climb a hill or small mountain to look at the foliage. The view—and a special snack—will make for a great adventure. To learn more about foliage conditions across the Northeast, check out these foliage websites. 9. Throw sticks into a stream or pond. Watch the ripples, see how far you can throw, and notice what floats and what sinks. 10. Follow your child’s lead. Just head outside and see what interests you. With no agenda, you may discover new games, like lining up pinecones on a log or racing the wind.